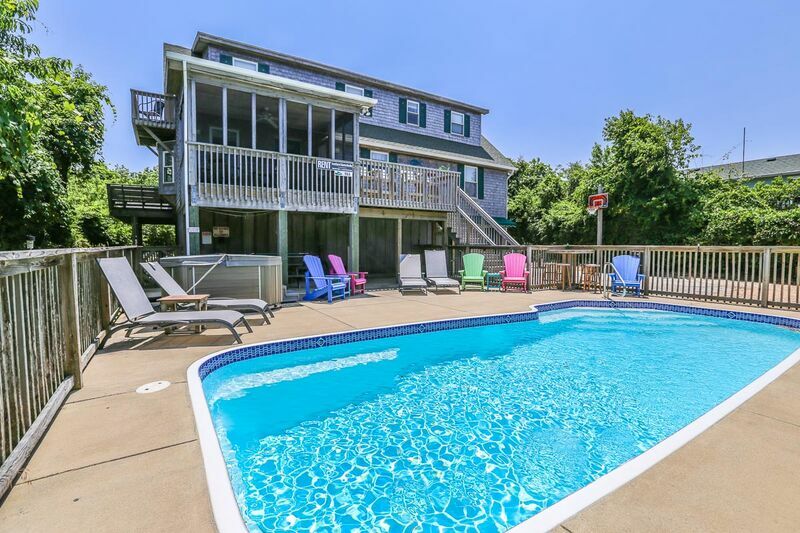 Classic OBX beach house ideally located in the center of Duck. Private setting just 347 yards from the beach. Easy walk to Duck Village for shops, restaurants and recreation activities. Spacious house with three stories and plenty of room for the family to spread out. Relax by the pool or in the hot tub or any of the four comfortable decks. Recreation room sitting area with CATV and PlayStation. Foosball table. Ping-pong table. Separate room for beach and pool toys. Master bedroom (with King, Twin sleep sofa, CATV and private bath with shower and laundry). Bedroom (with Queen, CATV). Bath (with tub and shower). Large, open living area with CATV/DVD player, stereo/CD player - opens to screened porch and open deck. Exceptionally well-equipped kitchen opens up to dining area. Bedroom (with Queen and Twin, CATV, private deck with horizon ocean views). Bedroom (with Double bunk set, CATV, private deck access). Bath (with shower). Cozy den sitting area.